Sautee onion and red pepper in olive oil. When almost done, add garlic and sautee until cooked. 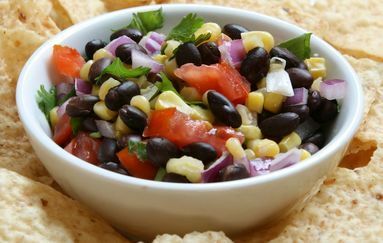 Add can of black beans, corn, water, vinegar, cilantro, cumin, and cayenne pepper. Bring to a boil and then reduce to a simmer. When mixture has reduced somewhat (usually 15 to 20 minutes) dinner is served!